Goa is one of the favourite holiday spots in the country. It attracts a high number of tourist as well. The city is famous for Bar and Beach. Tourist loves sitting and drinking on the beaches but aren’t concerned to pick up the waste. 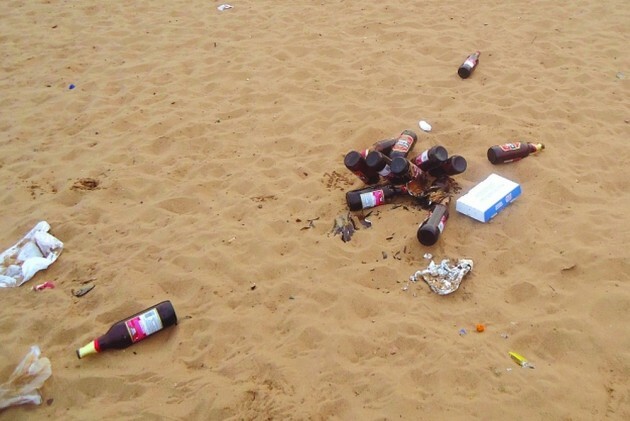 Due to this Goa beaches are full of beer bottles and waste material which results in loss of tourist. Recently, CM of Goa also announced then drinking in public is prohibited to clean the city. Now, according to The Weather Channel India, you can exchange the waste pop-up picked from the beach and can exchange it for a beer. Total of beer bottle caps or 20 used cigarette butts can fetch you a beer all thanks to an innovative green initiative. The initiative began on January 30, when the first of the pop-up waste-bars opened up at the Zanzibar shack, located at the beach end of the popular Tito’s Lane in the North Goa beach village of Baga. Baga beach is the most visited beach of the city. It will be extended to multiple venues in the next few months. From last few months, Goa is losing its charm, and the number of tourists are decreased in the city which is a major concern for the tourism department. To clean the beaches and make it more nature-friendly has led to the appointment of a private agency. Twitter appreciates the step while overlooking the moral responsibility. Looking for all these alternatives is a shame. All this won’t be required at the first place if every individual could behave responsibly. Leaving the waste at the beach has initially troubled the local residents but, finally, it will hurt the tourist visiting the city. If every individual can pick up their own waste and throw into the dustbin will be highly appreciated than doing it for a free bottle of beer. Previous articleJapanese Artist Yoko Ono Ask Twitter For Advise, Got The Best One From ICC.